In April 2018 I interviewed five Ukrainian soldiers who were fighting against Russian-backed separatists in the Donbas region of eastern Ukraine. “Why do Russian and Ukrainian soldiers always wear balaclavas?” I jokingly asked one young soldier, who called himself Myhalych. “I mean no disrespect, Sergeant O’Donnell, but that is a silly question,” he said after a long pause. The balaclava, or ski mask, originated in the Ukrainian town of that name during a Crimean War battle in 1854. British troops wore the headgear to keep warm. Later, in the Soviet Union, the balaclava was a standard-issue uniform item for many units across the Red Army. Today, its use has spread beyond eastern Europe to police, SWAT, special forces and terrorist organizations around the world. During the Irish War for Independence and The Troubles, members of the Provisional Irish Republican Army wore balaclava masks to conceal their identities. The balaclava is tied to a fighting tactic the Russians have used for more than 100 years. Maskirovka covers a broad range of military deception measures. At its core, maskirovka is meant to sow confusion. “Maskirovka may be conducted in any environment to deny information to sensors,” according to one 1988 Pentagon study. In Ukraine, however, balaclavas are maskirovka at its most pragmatic. According to the 1988 Pentagon study, the balaclava denies information to the most basic of sensors, the human eye. It’s difficult for a country to act or decide on a course of action when aggressors don’t wear insignia and conceal their identities. The Russians aren’t riding into Ukraine by the hundreds of thousands on the backs of tanks. Instead, they operate on a much subtler level, sowing discord and insurrection by whipping up a nationalistic fervor among ethnic Russians living in the Donbas. This concealment provides the Russian government with some level of deniability, despite NATO intelligence reports that clearly show Russia has boots on the ground in Ukraine. Regardless, the camouflaging of national identities has caused some level of uncertainty among Western allies. Denial, in fact, is one of the core tactics of maskirovka. After the Russian invasion of Crimea in 2014, it was clear that Russian special forces had seized government buildings. But Russian president Vladimir Putin in a news conference the following day denied that Russian soldiers were in the country. Five weeks later, Putin admitted that Russian troops had been deployed to Crimea after all, but maskirovka had served its purpose. To confuse an adversary. It took some time for NATO commanders to figure out the scale of Russia’s invasion, an invasion the Kremlin constantly denied. 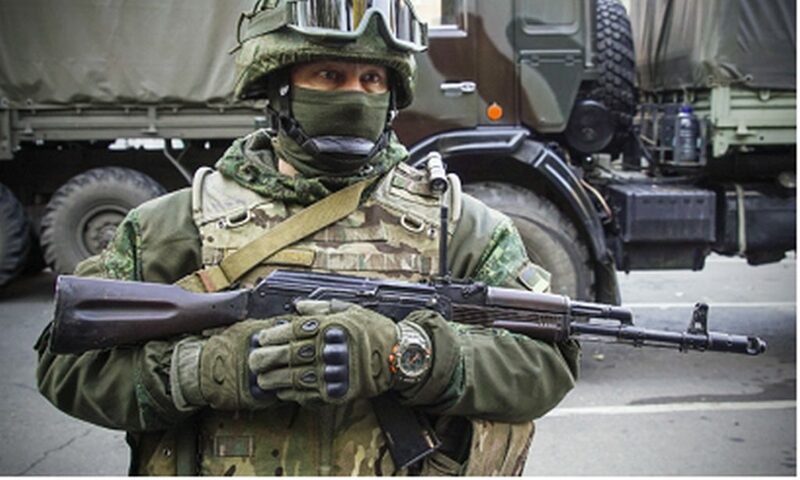 To complicate matters, the armed forces of Ukraine also wear balaclavas as part of the standard uniform. It is a visual affirmation of the closeness that once existed between Russia and Ukraine. Both the balaclava and maskirovka serve a definitive military purpose in Eastern Europe. Russia has spent decades perfecting this doctrine and is arguably the world’s most proficient actor of military deception. For Myhalych, wearing a ski mask is just as essential as wearing combat boots and keeping his weapon clean.